This framed picture has been hanging on the wall of my office through much of my career. It is a beacon of inspiration that requires me to self-assess and always ask, “Is what I’m doing right now, good enough for Escoffier?” The answer is usually, “No.” Back to the drawing board, work harder, research and learn more; Escoffier is the standard bearer for cooks and chefs. He has held this position for generations. Most chefs I know would consider Escoffier an influence and will likely have a copy of Le Guide Culinaire tucked away somewhere in their office. Escoffier was born in Villeneuve-Loubet, France in 1846. This small town in the south of France was eventually recognized as the home to the most distinguished and influential chefs of all time. In fact, Escoffier is referred to as the King of Chefs and the Chef of Kings. During his 62 year career (must be close to a record) in the kitchen, he was most noted for developing service a ‘la russe (service in courses – a ‘la carte), the implementation of the kitchen brigade (organizational chart with assigned responsibilities) that is still used today, and writing various professional cookbooks – most noteworthy is Le Guide Culinaire with more than 5,000 classic recipes. His repertoire was more extensive than the Grateful Dead’s concert sets. 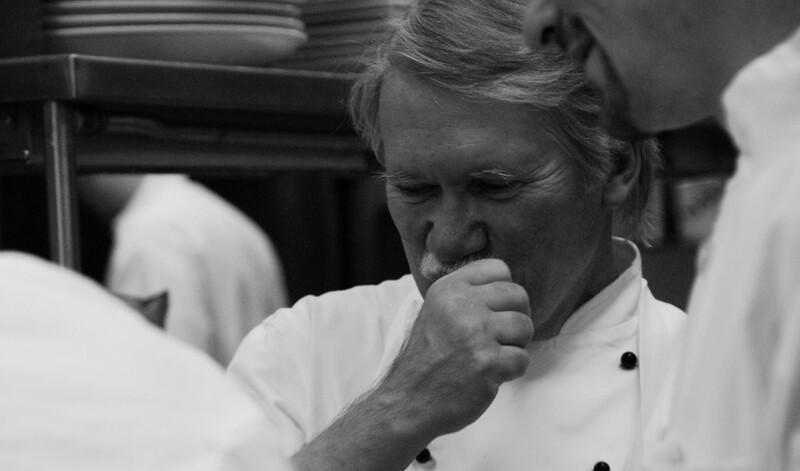 There are some interesting tidbits in the chef’s history that many people are unfamiliar with. He was a member of the French army during the French/Prussian War where he served as a cook for the upper crust rank of officers. In 1911, Ho Chi Minh trained under Escoffier as a pastry chef in London. And, he learned to control his somewhat rabid temper by taking deep breaths and walking outside around his hotels. Escoffier insisted that his cooks act and look like gentlemen in the kitchen and outside as representatives of his operations. He had to set and example, thus learning to keep his own temper in check. Escoffier teamed up with the famous hotelier, Cesar Ritz to open and operate world renown hotels: The Savoy in London, Grand Hotel in Monte Carlo, Grand Hotel in Rome, Carlton Hotel in London and the Hotel Ritz in Paris. Rumor has it that he was part of the opening team to prepare the original Ritz Carlton in Boston for operation. He was the consummate hotel chef, defining what a professional kitchen should look and feel like, and elevating hotel cuisine to new heights. The chef’s food respected ingredients and focused on flavor, simplicity, consistency and plating, ensuring that everything on the dish played a role and was edible. In the late 1990’s on a visit to France, I had the pleasure of full-filling a life-long quest to visit the Escoffier Museum in Villeneuve-Loubet. The museum is located on a quaint side street rising from the curb like the home of a prominent member of the community. The multiple floors of this once home to the chef, is filled with memorabilia from his 62-year career. Thousands of menus, tools, photos and paintings of the numerous dignitaries he cooked for over the years, cover every inch of the walls and display cases stretching from end to end. One room houses his original office. Now, I may seem a bit over zealous, and possibly strange, but I took the opportunity to place my hand on his desk. There was an electricity that ran up my arm as I felt for that instant, close to the greatest chef, the person whose picture hung over my own office desk. I felt in tune. 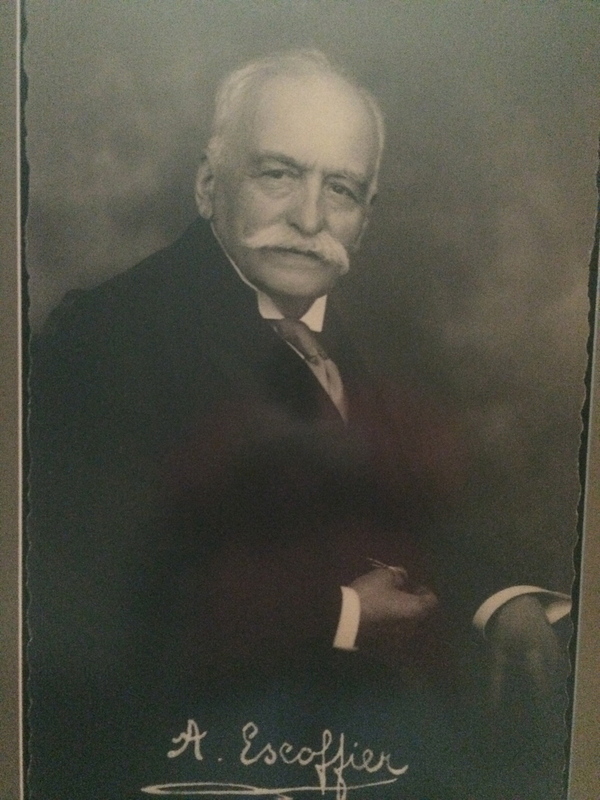 Escoffier epitomized those beliefs that so many chefs hold close. His passion for food, organization, structure, consistency, training and simplistic elegance above all else, has been repeated through the work of hundreds of contemporaries like Bocuse, Verge, Meneau, Robuchon, Ducasse, Keller, Trotter, Waters, Boulud, Tower, and others too numerous to mention in this article. For those who chose to make the kitchen their life, those who would rather cook for a living than anything else, a visit to the Escoffier museum is a must. Build it into your bucket list and make sure it rises to the top. In the meantime, I would suggest that you pick up a copy of his memoirs – a historical and incredibly interesting read.